KAABONG– Police has arrested two men for allegedly stealing Wine, Holy Water, and several other items from Uganda Martyrs Church in Kaabong district. The suspects have been identified as Francis Lochoro and Paul Ngelecha, both residents of Nakadelio village in Kapilan Bar Kaabong town Council. The duo was arrested on Tuesday after church management pinned them following the mysterious disappearance of church property. 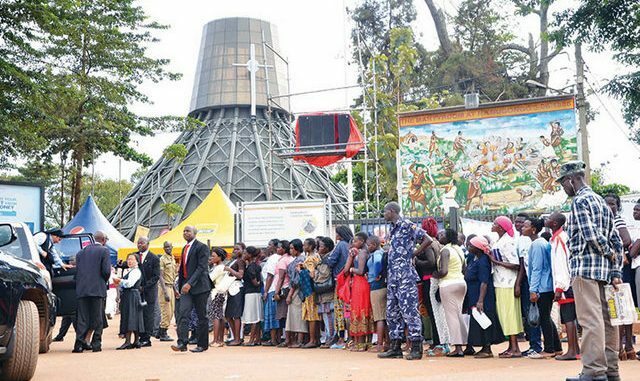 Church leadership; according to Police alleges that the duo broke into the Uganda Martyrs Church on October 15, 2018, and made away with wine, holy water, long mats, generator, and other electronic appliances. Godfrey Acirya, the Kaabong District Police Commander says the duo has been charged with burglary and theft. He confirmed that part of the stolen property was recovered from the suspects and deposited at Kaabong police station as exhibit. Acirya says they will be produced in court once investigations are complete. Haadaile Losilo, the Catechist of the Church, says he is ready to pardon the suspects if they confess and ask for forgiveness.